Custer, S., Rahemtulla, H., Kaiser, K., & van den Brink, R. (2016). 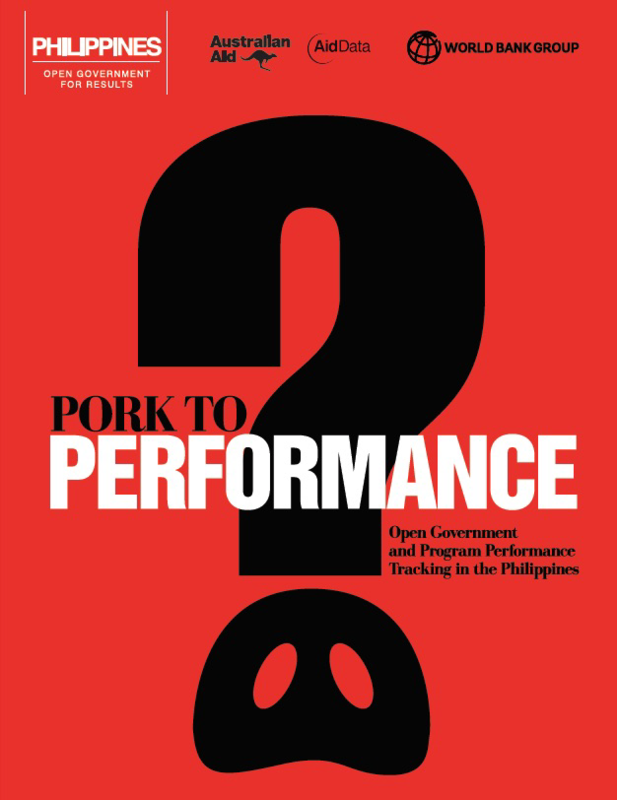 From Pork to Performance: Open Government and Program Performance Tracking in the Philippines. Washington, DC: World Bank and AidData. In June of 2016, The World Bank and AidData published From Pork to Performance, a study on the political economy of open data for service delivery in the Philippines. From Pork to Performance illuminates the politics of how public resources are spent and the difficulty of the “last mile” of service delivery. This study examines the extent to which technology and transparency can disrupt this low accountability status quo through turning information into collective action to improve government performance by strengthening the accountability relationships between politicians, service providers and citizens. 1. Service delivery is an important barometer of government performance and public trust. When governments fail to deliver basic public services (e.g., roads, schools), citizens experience the pain points in immediate tangible ways, from disconnected roads to absentee teachers. For most citizens, these micro-transactions at the last mile of service delivery – on the road and in the classroom – are the most powerful impressions they have of their government’s performance. 2. Poor information creates friction and perverse incentives that favor pork over performance. If citizens, officials, and oversight agencies can’t track the national budget, they remain in the dark as to how well upstream public resources translate into downstream access to services they consume daily. Money gets “lost” to corruption and inefficiency, basic services become private goods, and the public is left with few opportunities to reward or sanction politicians for results. 3. This study examines whether technology and transparency can produce better results. 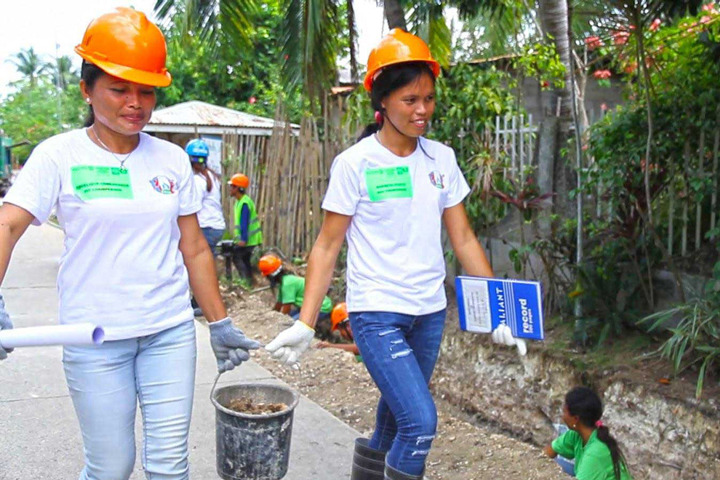 The World Bank Group partnered with government reform champions in the Philippines to design a series of digital accountability platforms to disclose information on the whole service delivery chain in a given sector – from upstream budgets to downstream implementation. The study features examples from five sectors (e.g., education, reconstruction, roads, municipal development, and tax collection). The platforms give citizens, politicians and front-line providers the tools they need to track public expenditures and seek to turn open data into collective action to improve government performance. 4. Translating technology into “digital dividends” requires getting the fundamentals right. The study assesses the results of five open government initiatives using an assessment rubric based upon four C’s: content, channel, choice, and consequences. The performance information disclosed must be timely and salient to end users (content); easy to access and use (channel); accompanied by credible outlets for people to take action (choice); and this collective action must be sufficient to change how policies are designed or programs delivered (consequences). 5. The success of technology platforms is interlinked with the broader politics of reform. We find that digital platforms are just the “tip of the iceberg”. If the data the government releases is obsolete or irrelevant, people won’t pay attention. If the technology channel to get information to end-users is inaccessible, people won’t use the data. If there aren’t obvious ways for people to give feedback, lobby, or vote based upon the information, they won’t take action. Finally, if the agencies financing and implementing government programs are unwilling to heed the data and respond to feedback, services won’t improve. 6. High-level leadership and inter-agency coordination are essential to track the entire service delivery life cycle. Coordination constraints – such as manual integration of data across multiple, disconnected systems – create roadblocks even on a “digital highway”. Governments need to put in place clear institutional structures to facilitate inter-agency coordination to: (1) comply with disclosure standards, (2) report performance data in a timely fashion, and (3) harmonize information management systems for seamless expenditure tracking. 7. Integrate digital accountability platforms within broader reform efforts, rather than as stand-alone initiatives. Platforms that are well integrated with sector-specific or cross-cutting international commitments have been more successful in galvanizing lasting political commitment, dedicated resources, and buy-in across agencies and levels of government. Prioritize those sectors where digital technologies can complement reform efforts already underway. 8. Design platforms with a clear view of the performance challenge to be solved and iterate with users to ensure it is fit-for-purpose. To deepen uptake, prioritize rapid iteration with end users to ensure that platforms are releasing the right information, at the right time, and in the right format so that citizens, officials, and oversight agencies can turn publicly available data into actionable insights. 9. Find ways that open government can align incentives to make politics work for development. Getting digital accountability platforms to “click” requires a constellation of actors who view greater transparency as being in their interest. Next-generation open government initiatives need to reframe the value-add of transparency as serving, rather than threatening, the interests of these stakeholders to break through gridlock. 10. Broaden the support base for digital accountability platforms inside and outside of government to have staying power. Mobilize the public to help improve official data on service delivery and they may be more interested in acting upon it. Demonstrate the value of platform data as a management tool for civil servants to more easily plan, implement, and evaluate flagship government programs. Can technology and transparency disrupt the status quo of pork-barrel politics and produce digital dividends by moving government performance out of the shadows and into the spotlight?